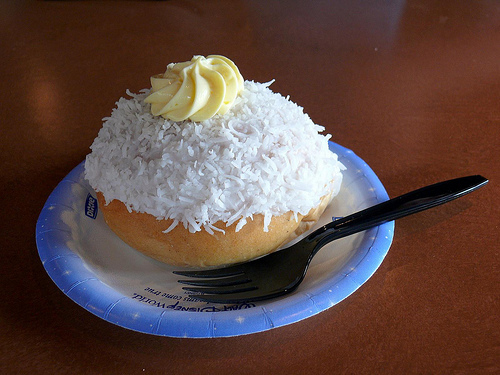 Last week, I talked about my overall top snacks at Walt Disney World. This week, I’m going to focus on snacks that are available at the World Showcase in EPCOT. One of my favorite things to do is to save up Disney Dining Plan snack credits and spend an afternoon or evening snacking my way around the World Showcase. There is a great variety of snacks (sweet, salty, and ice cream) available in the showcase as each country shows off its country’s food to the guests. This tour can also be viewed as “healthy” because you are eating and walking from country to country. Now, let’s go have a snack! We’re going to start our tour in Mexico and you can enjoy one of Disney’s best snacks….a churrito. 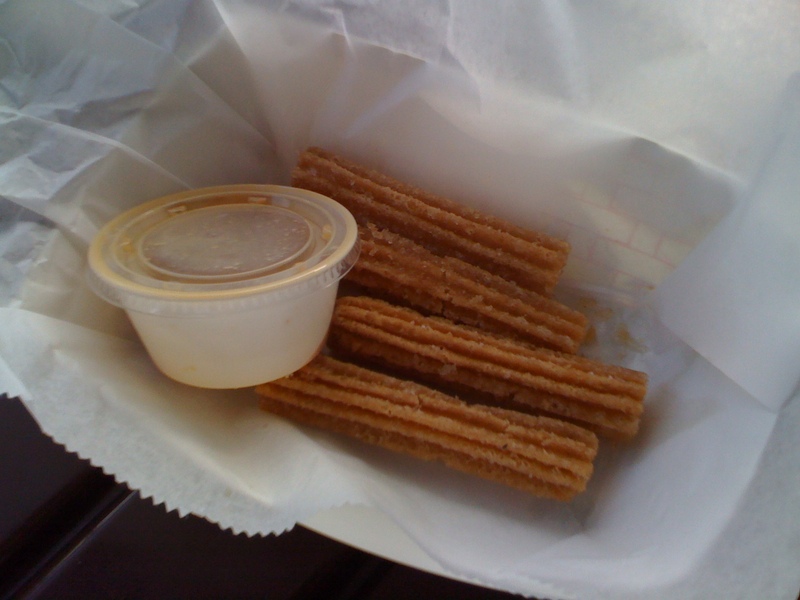 These churritos come in a group of four with a caramel sauce for dipping. I have found that the churritos when ordered from the table service restaurant as a dessert than from La Cantina de San Angel as a counter service snack. I don’t know why but it’s something that I’ve noticed. After enjoying some churritos in Mexico, it’s just a short walk to Norway where guests can two great Disney snacks: the Schoolbread and the sweet pretzel. These snacks can be found at Kringla Bakeri Og Cafe. These continues to the sweet theme from Mexico. Both snacks can be very sweet especially the Schoolbread with the vanilla custard filling. The sweet pretzel adds to the sweet theme. As you can see, there are two options: one drizzled in chocolate and the other is topped with almonds. 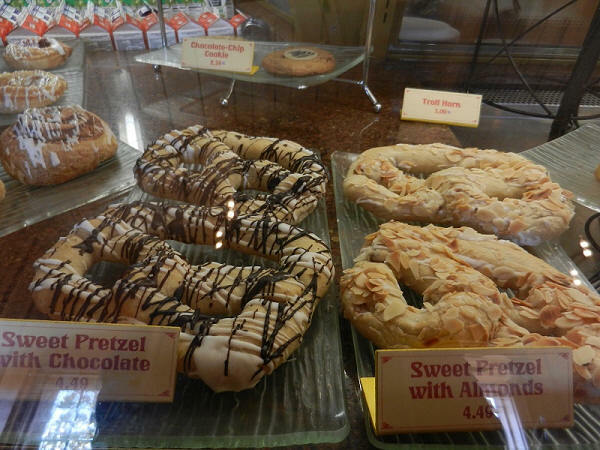 Both pretzels will definitely hit your sweet tooth. We will skip over China and make the long walk to Germany. Gotta burn off those pretzels, schoolbread, and churritos some how. 🙂 A guest could expect to see some pretzels in the Germany pavilion. Surprisingly, there are not pretzels available in Germany. They are available during the Food and Wine Festival but not during the rest of the year. The Germans do have two must-do snacks: apple strudel and black forest cake. Both are very sweet snacks but in completely different ways. The apple strudel will meet your sweeter side while the black forest cafe will satisfy a chocolate craving. After a brief stop in Germany, we make our way to Italy and grab our first frozen treat of the tour….an Italian Gelato. The gelato doesn’t come in a wide variety of flavors but there are lots of different ways that you can get your gelato. A guest can just get an ice cream cone or ice cream sandwich with the gelato or one of four different specialty snacks. 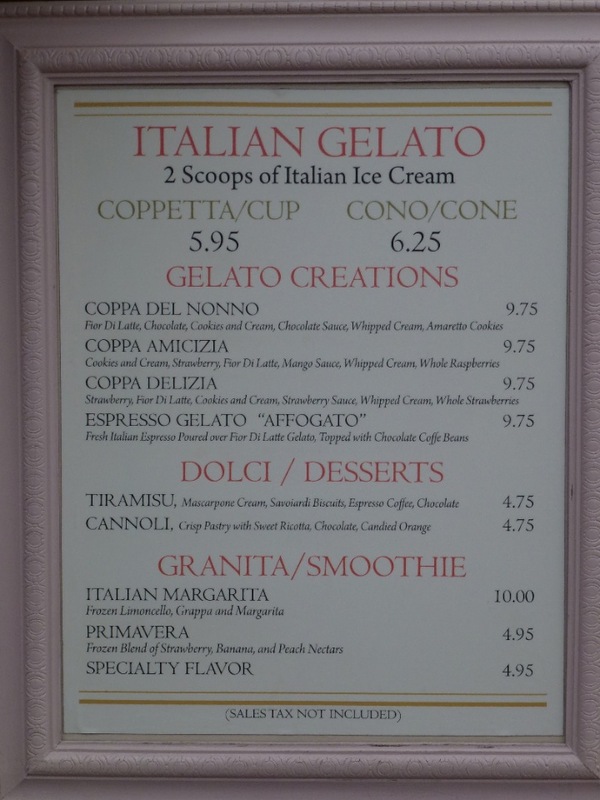 For those who do not want a gelato, there are still two non-frozen treats available with a tiramisu and cannoli. We are halfway through our trip as we reach the American Adventure and we get to one of my favorite snacks in all of Walt Disney World….the funnel cake. The funnel cake comes in a variety of flavors: a standard funnel cake with powdered sugar, topped with ice cream, apples, or chocolate sauce. 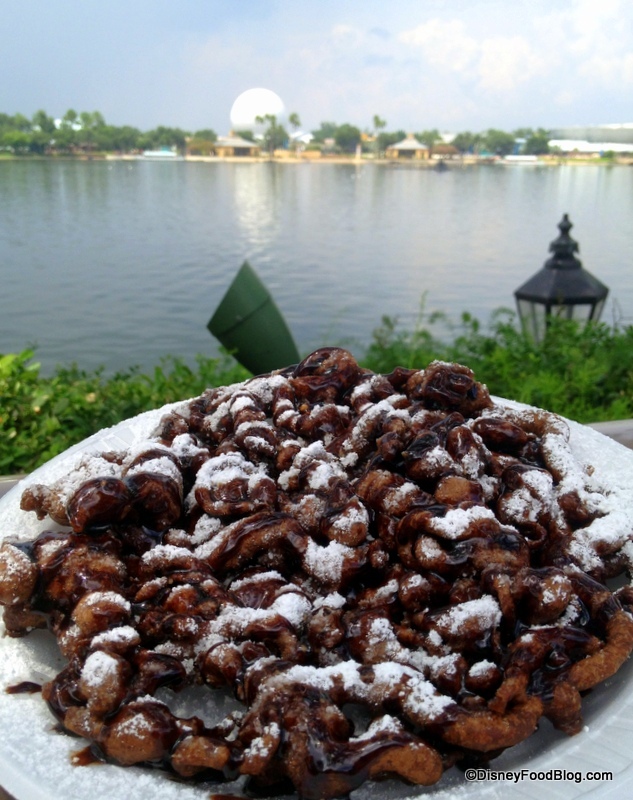 My favorite, however, is the double chocolate funnel cake. This funnel cake is made with chocolate fried dough and then topped with chocolate sauce. We make the “turn for home” as we head into Japan. In Japan, guests again have two options for snacks and both give a glimpse into the Japanese culture. The first is the sushi and the second is the Kakigori which is a frozen snack of shaved ice with fruit syrups. The best description of the kakigori is it is like a snow cone. After Japan, we make our last stop on the snack tour in France. If Hershey, Pennsylvania is where milk and chocolate meet. The France pavilion is where snacks meet. 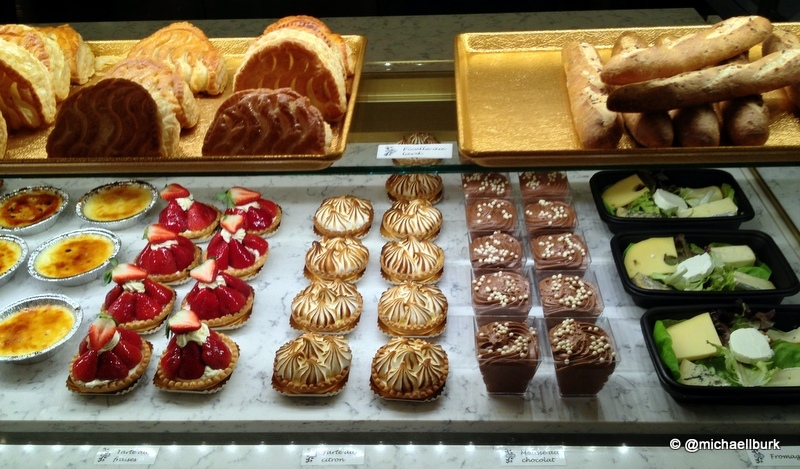 The France pavilion is a snacker paradise. There is a wide variety of snacks available. 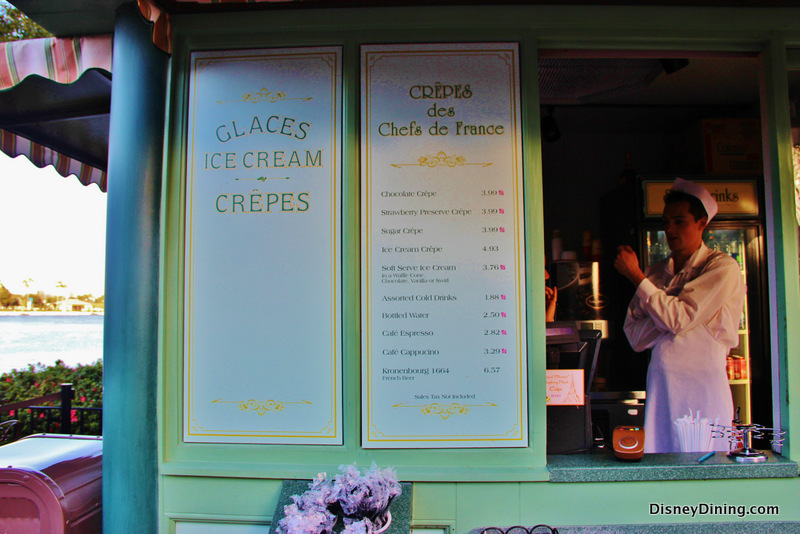 A guest can enjoy an ice cream sandwich from L’Artisan des Glaces, a crepe from Crepes des Chefs de France and cheese, breads, and baked snacks from the Boulangerie Patisserie. Out of all the snacks available in France, my favorite is a pressed brioche ice cream sandwich at L’Artisan des Glaces. I talked about this snack in great length in last week’s article. 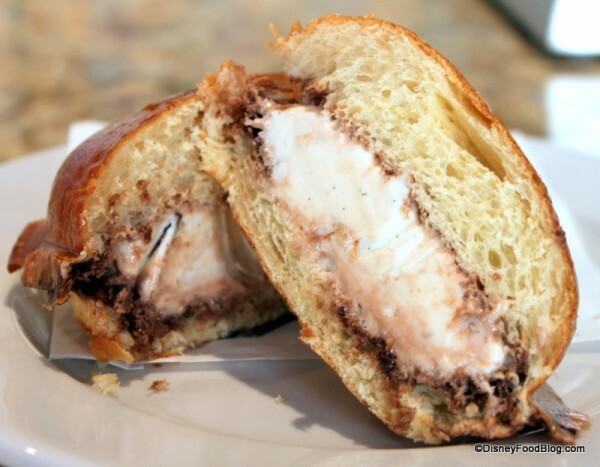 It is a great snack and the seal created by the pressing of the brioche roll doesn’t let the ice cream ooze out of the sandwich and make a mess. After you are finished snacking France, make sure to walk through the United Kingdom and Canada to complete your walk through the World Showcase. You’ve eaten a lot of snacks. That’s a lot of calories to burn off. If you were to ask me what my top five snacks are in the World Showcase, here’s my list. Two of my top five snacks are located in France. This shows the diversity of the snacks that a guest can find in the France pavilion. For the lack of effort that France has put into its movie, Impressions de France, it has put a lot of effort into presenting the food of its country and has done it very, very well. I hope you enjoyed this tour through the snacks of the World Showcase. It’s one of my favorite things to do though I could just stay in the France pavilion and stuff myself full of French pastries and snacks. I’d like to hear your favorite snacks that are available in the World Showcase. Leave us a comment below or on our Facebook page or Twitter feed. I made my first appearance on a podcast. I can be heard on Episode 39 of the Enchanted TikiTalk Podcast playing Fast Pass, Just Pass or Standby. Please give it a listen and support the guys who put a lot of work into this great podcast. The Dad For Disney Facebook group has grown over 300 members strong over the weekend. Thank you for this continued support. 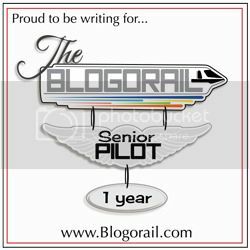 Please continue to tell your friends, family, and co-workers about this blog and great things going on here. There are pretzels in Germany. It’s a pretzel cart. I get them every time.